Kansas City Construction Sites have multiple needs for video surveillance solutions but often offer a couple of technical challenges. Now only can you watch live video from your Kansas City area Construction Site, but also create Time-Lapse movies of the entire construction project. The Sensera Construction Camera solves many of those issues. It provides a long list of important features that make it the ideal solution for any Kansas City Construction Video application. The solar panel powers the solar powered camera and charges a high capacity battery during the day and the system runs off the battery at night and during low light conditions. 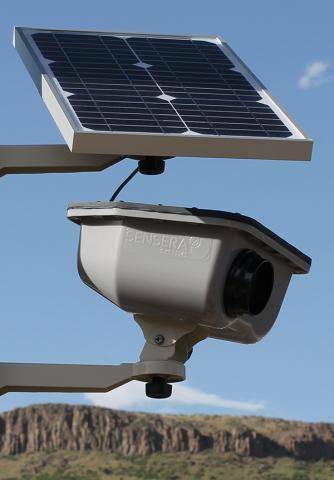 These solar powered cameras will power your construction camera in Kansas City or wherever you choose to mount the system. The next challenge is to allow remote viewing of your construction cameras from away from the job site. Our construction cameras are equipped with both cellular radios and wi-fi to allow for remove viewing and uploading of recorded video. 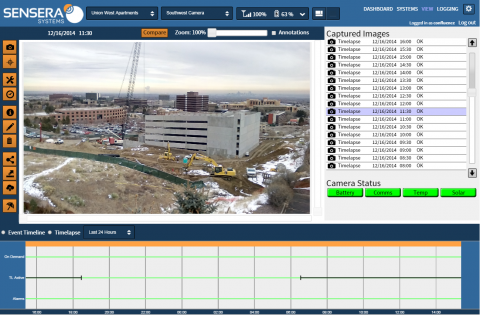 With this solution you could view live video of a Liberty Missouri Construction Site from Overland Park, Kansas or anywhere. At the end of the project, or anytime, you can easily create professional time-lapse movies of the project. These construction videos can be how-to videos or just a memento to share with important stakeholders. The camera can be set to record between 2 images per minute and one image per day. The images are high resolution 5MP to provide excellent clarity and detail of your Kansas City Construction site. All you need to provide is something to mount the camera system to. We supply the rest. Even the cellular communication plan. When you are finished with one project, it is easy to reinstall the system at the next one. The GPS module will even update the location in your web-based software. There are many other applications including: Kansas Oil Well Monitoring, Kansas City Area Farm Monitoring, Kansas City Area Property Monitoring, etc. We will gladly meet you at your property to help find the right solution for you.